Not sure about maximum email file attachment size that can be sent via email? Maximum email attachment size limit vary according to email provider being used. Each email provider has own limits on file size that can be attached to an email message and delivered successfully. 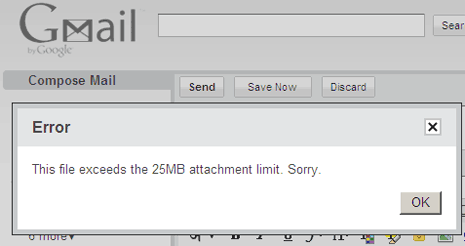 Gmail has email attachment size limit of 25MB. This means you can attach multiple files to maximum total size of 25MB. If you sending email to another Gmail ID, then you can easily attach and send files upto 25MB. Yahoo Mail email users have maximum email attachment limit of 20MB [source] with total encoded size of 25MB [source]. You can send bigger attachments using apps in Yahoo Mail beta (only). Also, there is option to upgrade to paid / premium Yahoo Mail Plus package. Ideal email attachment file size? Majority of web based email providers have limit of 10MB. Hence, you can safely send files upto 10MB between any email providers without the fear of message not being delivered. If you sending email between 2 Gmail IDs, you can attach maximum files upto 25MB. However, it is advisable to keep attachment size less than 10MB (as email may not be delivered, if same Gmail ID email with 25MB file attachment is forwarded to Yahoo Mail ID)! How to use Gmail to send email from other email IDs? I think they have to update the sizes of the space of gmail or yahoo. This must be dealt with. Good news for mailers who are facing problem with big attachments.Now yahoo had introduced new feature where we can attach 100mb file size. but you can always use “mailbigfiles.com” or other services like that, which are often free. I think Y! is just more transparent about their practices. I suspect both companies have a bit of buffer in the message size limit too.